So, just back from a fascinating weekend in London which began with a quick browse in the bookshop at the Wellcome Collection. Since we were passing, I couldn’t resist a quick nosey and “may” have been sucked into some purchases. The Hunterian was my next stop, somewhere I have always wanted to visit but never got the chance. The curation of this museum is just beautiful with light magically illuminating the hundreds of anatomy, pathology and zoology specimens. 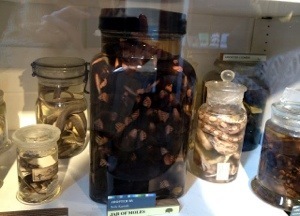 Being 6 months pregnant, I was intrigued to see the different specimens of foetal sizes. Although this could be upsetting to some, I found it really educational and fascinating. It’s been some years since I have seen the ‘bodies’ exhibition in Earls Court which also showed the different stages of foetal development. It’s amazing the difference in size in a matter of weeks. I was also lucky to be able to purchase a few original postcards from the original Potter museum. It was also my absolute pleasure to meet Joanna Ebenstein from Morbid Anatomy in NY. I have followed her blog for some years now and always feel mild pangs of jealousy towards the lucky New Yorkers when I see all the amazing talks and lectures that take place in the Morbid Anatomy, all those miles across the ocean from Ireland. On to Saturday & Sunday where I attended the symposium “Reclaiming Spectacle” which along with the Potter book launch was part of the Congress for Curious People. This 2 day symposium packed some punch. I was impressed with the expertise of all the speakers and was overwhelmed by the engaging content. I seem to have come away with lots of scrawled notes on bits of paper which I hope I can make sense of and which I’m sure may influence my own practice in one way or another. Tessa Farmer has some great stop motion films as discussed under the topic of “the micro-spectacular”. Well worth a look on utube. 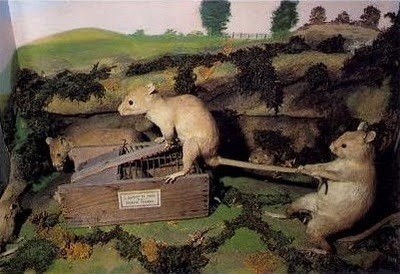 I was also reminded of the work of Mark Dion who I had sort of forgotten about. I saw a piece of his at Tate Modern some years back where he excavated a section of the Thames bank and displayed all his archaeological finds in the gallery. I must re-explore his work. Tim Cockerill who is a zoologist by day and circus performer by night, gave an enlightening talk persuading the audience of the authenticity of the flea circus. 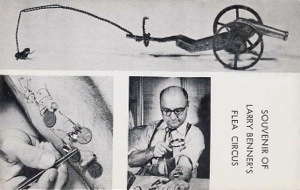 I myself always thought they were just a myth but Tim has learned the art of harnessing and training fleas and is on a mission to resurrect the flea circus in all its hopping glory. His main problem is the near extinction of the human flea, so has had to adapt to using other fleas. Bring back the days of the great unwashed, all is forgiven. 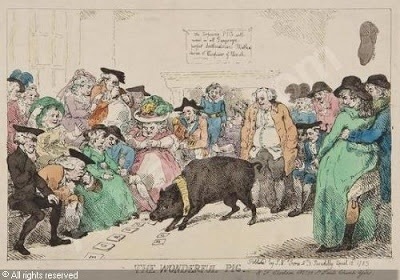 Oh and the best part is, the flea performers need feeding from a human source… As one Flea Circus “Professor” so eloquently put it “I live off them, they live off me”. Chiara Ambrosio gave a fascinating talk about Tarantism, a sort of dance mania that gripped individuals in Southern Italy and was perhaps a way of dealing with an individual’s own trauma. It related quite closely to an installation I did for my BA show relating to St Vitus’s dance, a slightly similar dance mania to hit parts of Europe. In both cases the dancers are accompanied by musicians who play frenzied music for days if necessary. Some footage on utube documents Tarantism and makes for fascinating viewing. There was so much over the weekend, these are just a few of the things that stood out for me. As I leaf through the scraps of paper in my handbag, I’ll probably post other interesting bits and pieces! Congratulations to all at Morbid Anatomy/ Preserved /Strange Attractor for hosting such a worthwhile and thought provoking event.